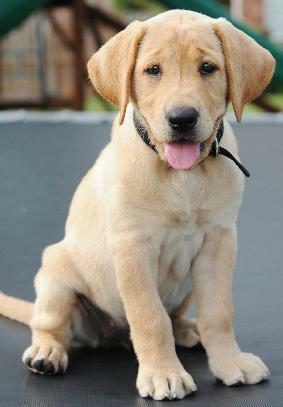 If you have purchased a puppy from us and would like to be listed on our "new friends" page, let me know! When you get a dog, you count on the breeder to sell you the best possible dog. Bonni did that. Then it's all up to us as the owners to turn this champion into a princess! That's exactly what we did with Molly. 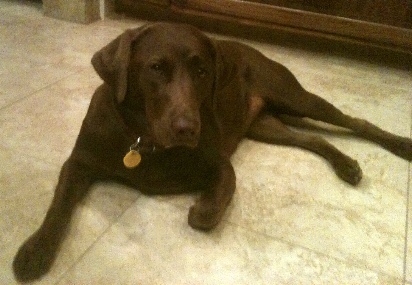 We have a nine month old champion chocolate lab princess. She is always happy, loving and has never found another dog that she doesn't love. Part of this has to come from the fact that Bonni started them out with other dogs and kids. 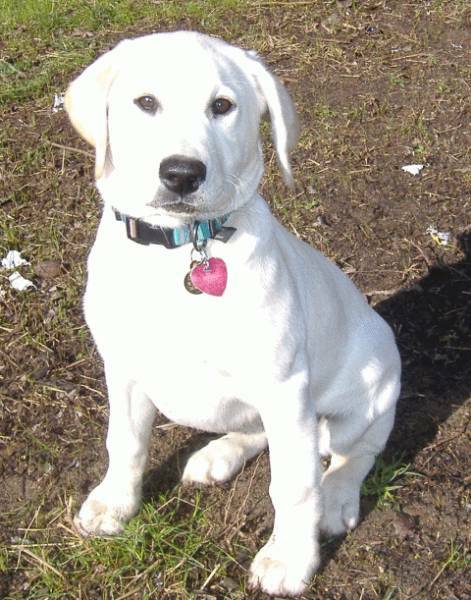 Being that I don't live where Molly was born, I looked forward to those adorable puppy pictures that Bonni always sent of my angel with the red diamond collar. Now Molly loves to swim and go for walks. Her nose is always to the ground following the scent. She points neighborhood cats and squirrels. 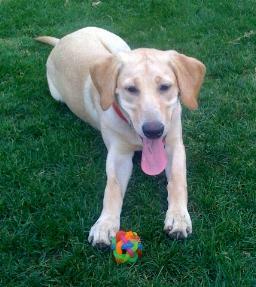 She's great at retrieving balls and training dummies, but we still need a little work on "drop". She will be going hunting with us this fall. So far she does not seem gun shy. 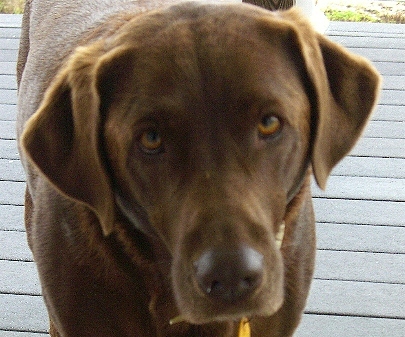 Molly is such a big part of our family that it's hard to imagine us without her.Thank you Bonni. Buddy has shown his quality breeding and blood line from the day we picked him up. To be honest we were not looking forward to a trip back to Florida with a 6 week old puppy who just left his mom. But he proved to be an excellent trip partner. He slept in the basket just fine… let us know he did want the A/C on him though, and went to the bathroom immediately every time we stopped like he already knew what to do. He is now 5 month old and he continues to show his intelligent. My friends are amazed at how well behaved he is! I have a doggy door and he was using it to go outside to the bathroom with-in 2 weeks. I have other dogs and the fasts I have ever trained one to go outside is 6 weeks. Of course he is still a puppy and he is very curious so he has to go in his pen when I am not home, which he goes right in when I tell him I have to go out. Buddy has proven well worth the trip to Texas to get him. He is a beautiful light cream color with just enough tint on his ears and the tip of his tail to make him prefect. He already weights 52 lbs. I do believe he will be about the same size a Gordy his father. It was very scary purchasing a dog sight unseen but you were a great help and sent picture and emails all the time, so I felt like I knew him by the time I got there. I would highly recommend your pups to anyone. You are a quality breeder and very honest. 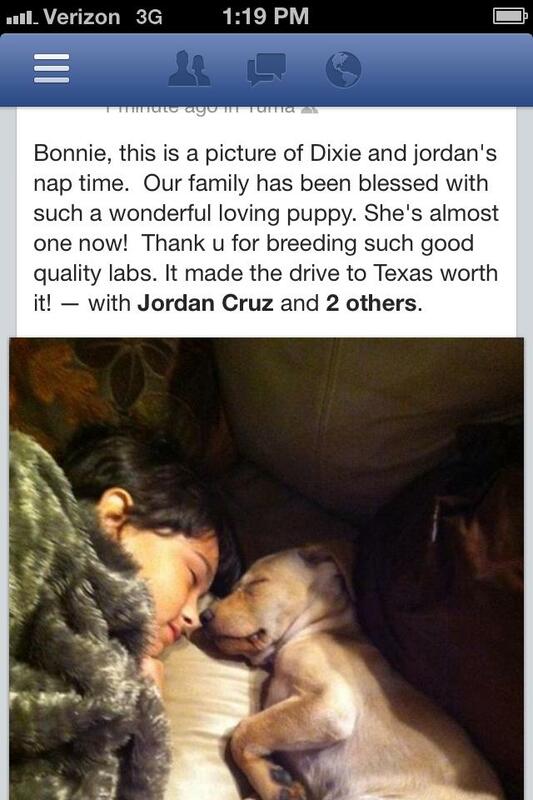 Bonni, We bought a puppy from you back in January, we have really enjoyed her. I wanted to let you know our appreciation of you and your family with the gift of Gracie. When we decided that our family was ready for a new addition we knew where to go. 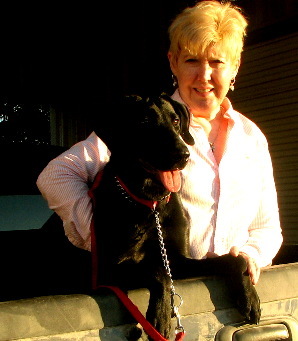 We had heard nothing but wonderful praise about Crumpler Kennels and the care and quality of your dogs. We had heard about the love and updates that you gave to all the new owners about the puppies and your openess to communicating to new owners about their pups. What we had heard turned out to be very true and then some. Once the pups where born, you contacted me and let me know all the details. The weekly updated pictures on your site allowing us to see the growth of our pup and the complete medical history just added to the value of what we were getting. You are more than a kennel owner, you are a care giver and friend to all. Your honesty and advise was always appreciated and still is. What we have enjoyed most about our experience with Gracie is that even after we left with her in our arms, you checked up on us and have been keeping a line of communication open with us. Anything we have a question about, training, puppy manners,etc., you are always there to lead us in the right direction. The wealth of information you gave us once we picked up Gracie, her shot record, her blood line all is valuable. Our vet was very impressed with the information that was kept on her. 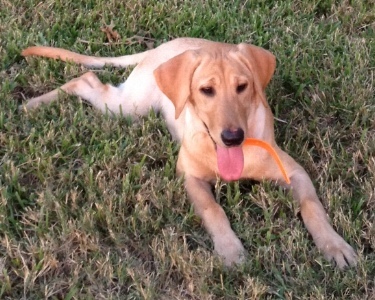 We found out that not only do we have a beautiful dog, but through training that she has gone through with a quality lab trainer, we have the makings of a champion retriever. Thank you Bonni for all you have done. Having Gracie in our lives is a blessing and she is a very welcome addition to our family. 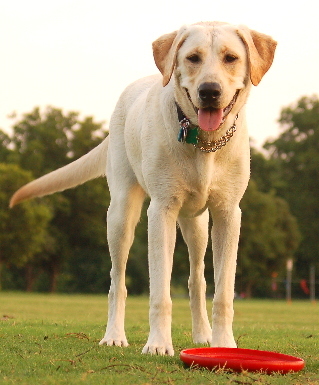 We are sure that our second lab will also come from Crumpler Kennels. Bonnie, My name is Amy Yoder. My husband and I purchased two dogs from you a little over 2 years ago. 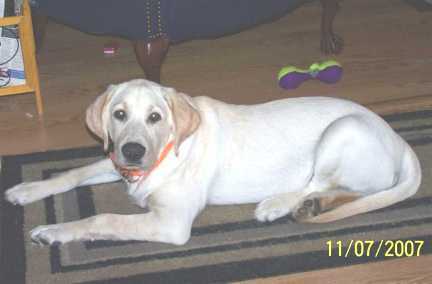 We are from Dallas, Texas.We have a boy Cody who was fathered by Gordy and is 2 1/2 years old. We also have a girl Sadie who was also fathered by Gordy but a different mother. Sadie just turned two years old this week. I want another puppy but my husband tells me no. We would not be the same with out our "munchkins". We are so thankful for you and your family giving us our "munchkins". Thank you again and maybe one day I can talk my husband into getting us another "munchkin". You know you will be the first person I contact. I just wanted to tell you how much we love our dog that we got from you! 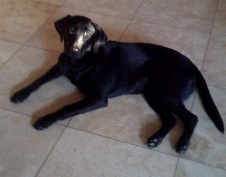 She is great, the best dog ever. 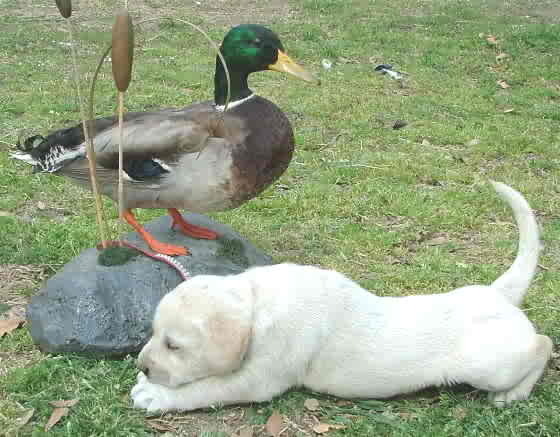 She was very easy to train and an excellent water retriever; we had her house broken in a week if that! 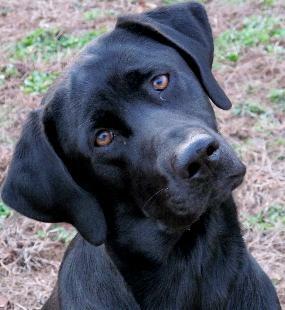 Anyways I will definitely be recommending you to everyone I hear of looking for a lab. Whitney and I adopted Miller from you last year and she is just coming up on her 1 year birthday. We wanted to share how happy we are and what an amazing puppy we adopted from you. She definitely has quite the personality and boundless energy. Most of our free time is spent taking her to the dog park and meeting up with Willie (her brother that Tony adopted the same day). They LOVE to swim and you can definitely tell that they are brother and sister. They recognize each other every time they get together and can't help but get into trouble as only brother and sister can. We are super happy and Miller has brought a lot of joy to our life. Just wanted to say thank you. Hope all is well, we have been keeping our eye on your website and love the pictures of all your dogs as well as all the recent puppies! 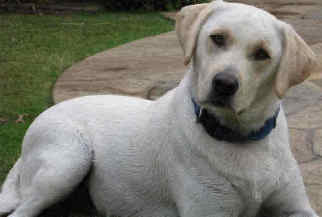 Bonny , we got him on December 2007, we name him Luigi is a perfect white Labrador , we are so happy to have him as part of our family , it excided any dog’s owner expectation, it is smartest, sweetest, gentile and lovely dog and it is our best friend and we love him so much!! 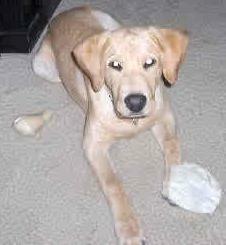 A few years back, Oct. 26, 2006 to be exact you sold Sherry and myself a puppy that we happily named Abby. Abby was born Sept. 05, 2006; the puppy of Gordy VI and Swiggart's Lady Bug, the papers you gave us say she was "#6 Red collar w/ paw prints). While I never had the chance to meet you, Sherry spoke very highly of you. You probably don't remember but Sherry flew back to Connecticut with Abby the day after she picked her up; something you were not too excited about but it work out just fine. Anyhow, I have been meaning to write you for some time now but have never found the time,today I am making the time. Abby is absolutely amazing! She is completely loved by everyone she meets. She is warm and friendly and always ready for the next big adventure. We go everywhere together including to my job where Abby spends her Friday's lifting the spirits of my staff as she wanders the office saying hello to everyone. Abby is a BIG fan of the snow; she spends most winter weekends in Ludlow Vermont playing in the snow and snow at home in CT is an added bonus. Her summers are spent swimming in Southport harbor which is located a short walk from our house. She has been on adventures to Maine, Massachusetts, Rhode Island, New Hampshire and more. Everywhere she goes everyone wants to know were this beautiful and well behaved dog came from. I wanted to drop you this note and thank you and tell you how special I feel to have been given the gift of having Abby in my life. Sherry unfortunately took a job in Massachusetts and we don't get to see her as much as we would like but we do stay in touch; Abby will always be our dog. 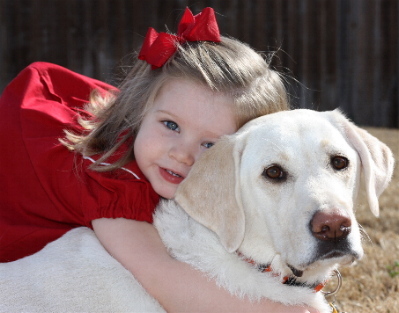 "when I think back I wonder if it was all worth it, then I see these pictures and know it sure was"
There is nothing like the love from a Lab. 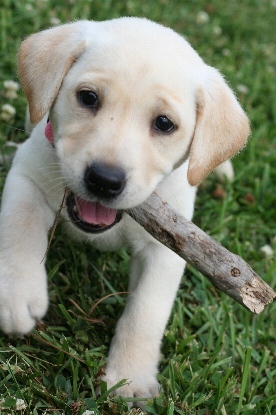 Rick and I are continuing fighting the urge of a yellow Lab. It’s been over 8 months since we’ve had Bleecker and I can’t tell you how much joy she’s brought to our lives. 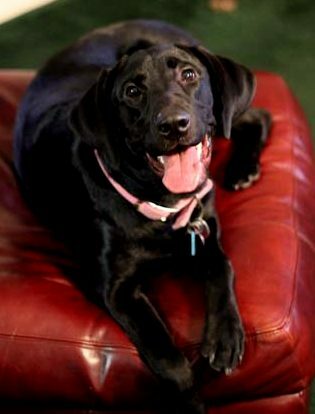 Not only is she extremely intelligent, she is also very sweet, loving, playful and beautiful. She’s so friendly that it often takes us longer to take a walk as she wants to say hi to every dog that passes. Her favorite thing in the world (aside from chewing bones stuffed with cheese) is playing fetch on the beach. She runs into the waves to get her ball and always drops it at our feet for more. She can go on for hours. The drop part took a couple of months but she’s a pro now. She gets along well with everyone, including our kitty, although the cat might beg to differ since Bleecker just comes up to her and licks her face. She's got a beautiful coat and even grew into her ears. ;-) Thanks for everything, we’ve very happy to have such a wonderful dog. I wanted to let you know that Tex is doing great. He could fetch one day after we brought him home. He sleeps all night in his wire crate + bed. 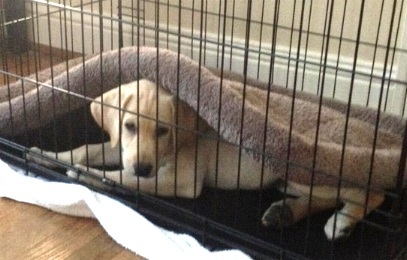 He did not like the carrier-type crate, but was a-okay with the wire type with his soft bed inside. He wants to be able to see us, whether he is in our out. He is almost completely potty trained, goes all night, about 11 pm till about 7 am. His only sin is chewing. I have to crate him if I am not watching him because he chews everything. This is not a surprise. I adopted a puppy from Faith and Modo’s July 2009 litter, and named her Maggie. She was the runt of the litter being born at 1/4 lb., but you would never know that from her fun loving, feisty personality. At 11 months and 70 lbs. she’s too big to fit underneath the couch, yet still sits on my lap. She is extremely loving, sweet and always has a smile on her face. She is very intelligent and tries her best to be well behaved. Even though full of enthusiasm and excitement when getting ready to go outside to play or walk, she always manages to sit, so that I will open the door. When playing with her best playmate, Brink, her most notorious move is to crouch like a lion, sometimes waiting, sometime crouch-walking, and then pounces on him. 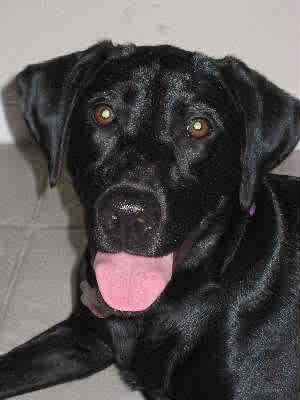 A few of her favorite activities are to go swimming, chase bugs and give tons of kisses (to human and dogs alike). Her funny antics and loving personality always puts a smile on my face. She is a joy to have and owns a big piece of my heart. Hi Bonni,I just wanted to touch base and let you know how much we love our Buck. He was born march 23 to Modo and Faith. You always told me in your emails how hyper he was and that he was the "leader of the pack". haha. I was so scared to bring him home because I wasn't sure I could handle a wild dog. Well, he is awsome! My husband says he is the most laid back lab he has ever owned! 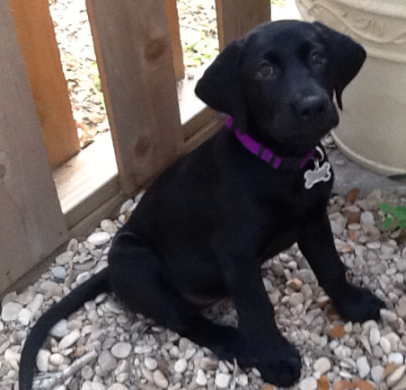 He was sitting and fetching at 8 weeks old. 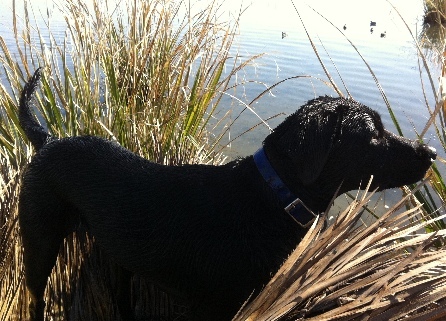 He is now 4 1/2 mo's old and sits, stays, fetches, knows his toys by name, retrieves doubles, and loves the water! We are still working on heeling as he has become a teenager. He has his own bean bag inside and knows to go to it when told. it's amazing how he understands english. 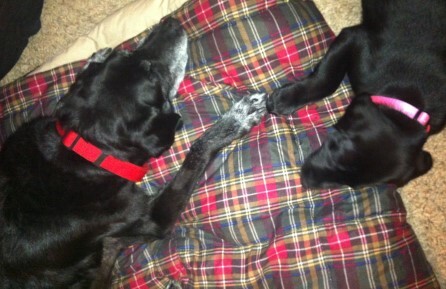 I suspect that all of the litters between Modo and Faith are just as wonderful Buck. 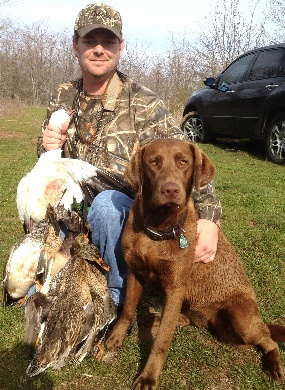 We have enjoyed him so much and can't wait for duck season. I am so glad I followed my gut instinct when I chose him on your website. Thanks for all of your emails they were great. I just wanted to thank you again for such a wonderful dog. I couldn't have asked for anything better. She's the most well behaved loving dog I have ever seen. And yet still has all the drive in the world to retrieve. I greatly appreciate it! I picked up my little girl from you 5 months ago and my has she grown she was only 13 pounds when i picked her up. now she 60 pounds and shes still growing =). She has brought so much joy into my and my parents live. Shes a bundle of energy, but knows when to settle down. She is so smart, she follows all my commands except to not jump on people when then come in the door. She gets so excited anytime someone come over she just want to lick them to death. She gets along great with her sisters (the mini dachshund) we even adopted a stray cat and she was so friendly to her she had never even seen a cat and she is so gentle and sweet to her. She is the light at the end of my day. no matter how gray my days going with work or school i always have Zoey to come home to to brighten up my life and bring a smile to my face. I was a little weary about your policy of not being able to see the puppies before you purchase them or even put a deposit down, But i think your reasoning behind your process is very good. My over all experience excellent you updated me with pictures every week on how she was doing and her weight.You answered all my dumb question no matter how dumb fast and with great concern. 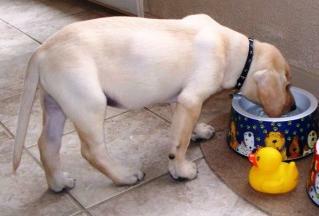 I would and have recommended you to many people who have been looking for labs. 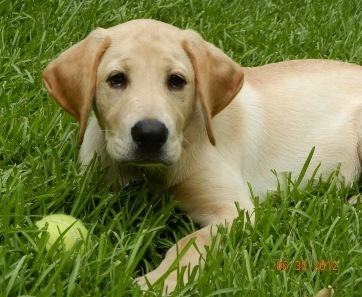 And will be getting a yellow male from you when i have room for another dog =). I thank you for what you do and i hope you continue what your doing the world needs more dog breeders like you. 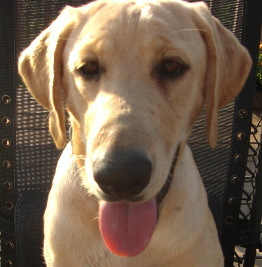 Betsy is a happy 8 month old Lab who lives with her mommy and daddy Diane and John Whiteley In London Texas on a ranch. She loves to play with cats , her chew toys are a favorite with her. 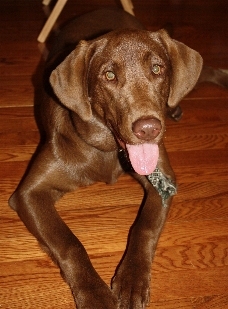 She is crate trained and loves her bed and just enjoys running and playing, barking at deer and looking at butterflies. 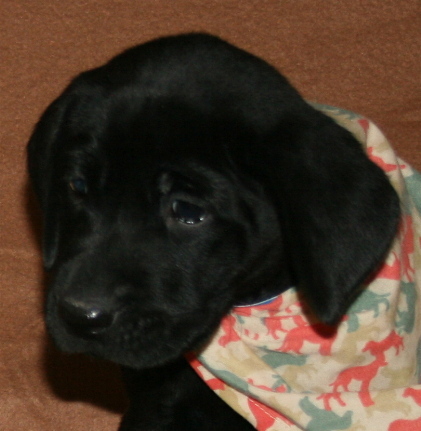 My husband and I got one of faith and modo's march 2010 litter. We wanted to update you and say thank you. 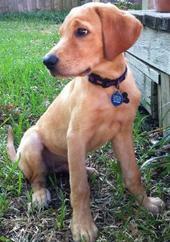 We are so glad to have Ellie Mae (on most days) :) She is still 100% puppy but she is smart and loving. She has become so close with our 6 year old lab and has truly given him new life. We laugh all the time at her expressions and antics. There was a time when I thought you had sold me a devil dog because she chewed up my bible, journal, and prayer book all in about 30 minutes! It makes for a good story and really since then she has mostly stuck to chewing her bones and her brother :) She absolutely loves other dogs and is great around kids. Thanks again. 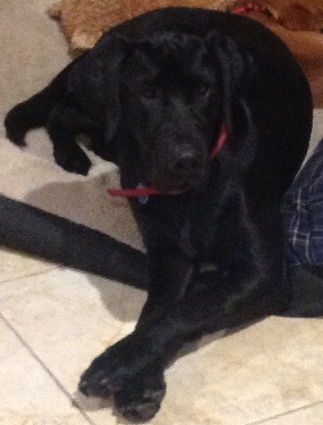 We will recommend Crumpler Kennels to anyone looking for a lab! 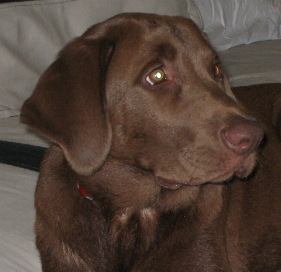 I wanted to tell you that Bosco (born 9/6/10 -- Modo+Sophia) is the smartest and best behaved Lab we have ever owned. He is one of the family, and he still makes noises like a little goat! He talks, does his routine of tricks, and is a momma's boy. He house trained very, very early, and he was crate trained very early, too. 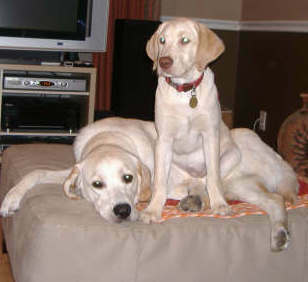 He gets along great with Mollie, our 6-1/2 yr. old Lab, although she makes it clear that she is the boss! His build and coat are excellent. We have never had such a fine dog. Thank you for such a wonderful dog. You guys have done a stellar job. 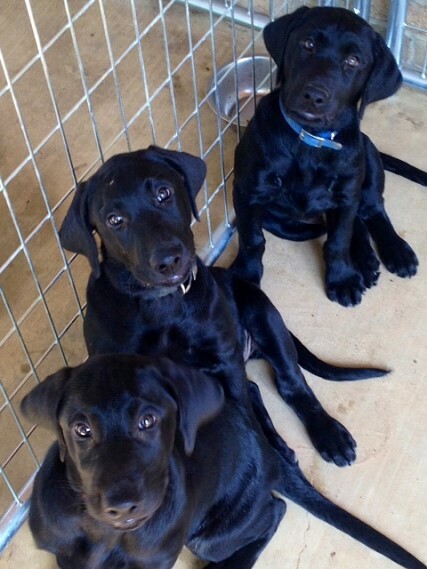 Our next Lab will ONLY be from Crumpler Kennels. We purchased a pup from you May 2010. We named her Remington Black Ice. On the long drive from Texas back to Kansas the day we picked her up she slept with her face to the cold A/C vent over half the trip. 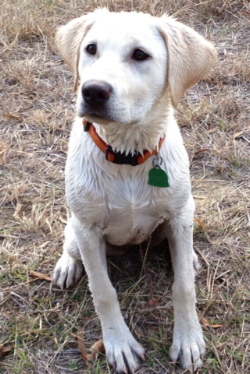 She is the best pup ever, great personality, very smart, and an amazing hunter. 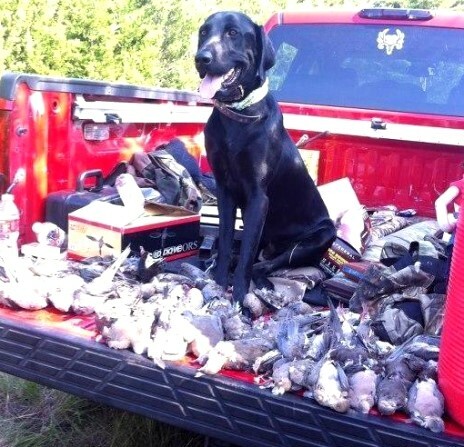 She was impressive for a first year pup on both upland and waterfowl hunts. 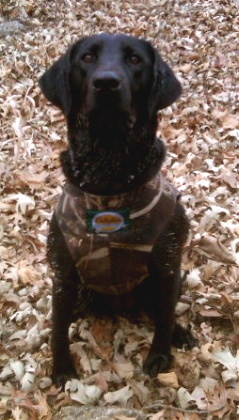 She retrieved every duck that was shot over her and loves spending hours in the duck blind watching as birds flock in. Beside from hunting she is also a very lovable pup and sleeps next to Shelby every night. This picture was taken in January after a duck hunt on the Walnut River in Kansas, it was so cold she had ice forming on her hair. Shelby and I recently got engaged, we plan to use her in our wedding as the ring 'dog' and train her to walk down the aisle. Thank you for this amazing dog. I wanted to let you know how Bayley is doing! She is almost 60 poundsnow and has been the perfect dog! Thanks again for our sweet baby. Scout has been such a wonderful and loving dog since the day we got her. 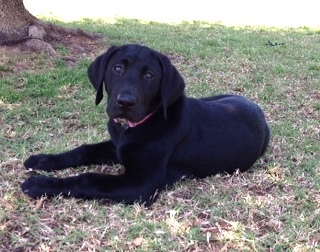 At 4 1/2 months old she is house broken, knows many commands, water retrieves and much more!! She is a great family dog! She has brought us so much joy and also many laughs! She has the funniest personality and we love it!! Everywhere we take her people stop and tell us how beautiful she is. It was such a pleasure doing business with you. 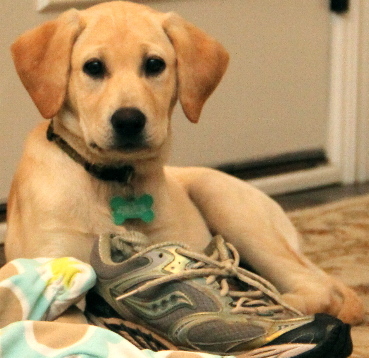 I loved the weekly updates you sent out with pictures of our growing puppy! We felt a very close bond with her immediately because we got to watch her grow from the day she was born! My vet was also impressed not only by Scout, but by all the notes that were taken while in your care. 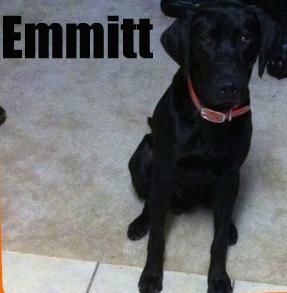 I would definitely recommend your kennel to anyone looking for the perfect lab!! 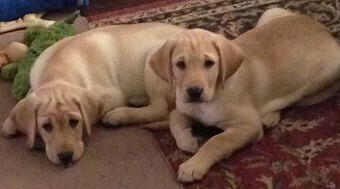 Hi, Bonnie I just wanted to send you photos of the puppies we got from you The boy is Tapley and the girl is Etta. They are so much fun! Tony and I took them to obedience class and they passed with flying colors. Bonni, I bought a pup from you when I got back from Iraq about 2 years ago, and now Kobey is the greatest, most behaved family member(Don't feel right callin him a dog lol) anyone around has had the chance to be around. He is a70lb lap dog/person. I swear if he could talk, we could teach him to drive a car. I figured you would like to see how the runt of his litter is doin!! Dylan (GA)"Life's a garden, Dig it!" 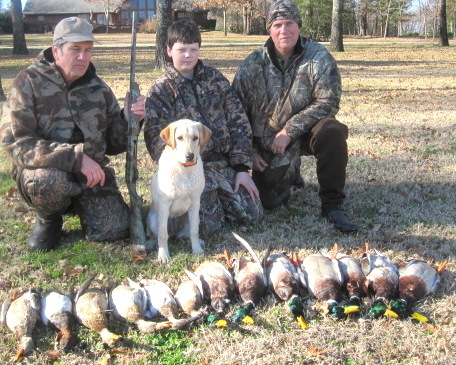 Here is a picture of Bree on her first successful hunt on the last day of duck season. I had taken her out a few times before but she is a bit gun shy so we are working our way through that now. 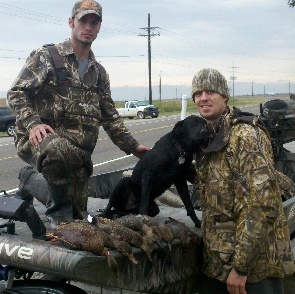 This hunt, I left her in the truck till most of the shooting that morning was done and then brought her out. She retrieved all the ducks I sent her after including some 100 yard swims minus her life jacket and was very proud watching her the whole time. I thought that I would send you a picture of Honey to let you see how she is doing. When looking for a breeder I did a great deal of searching. I happened to come across Crumpler Kennels and I knew they were who I wanted to get my puppy from. Honey is extremely smart and has been taking to potty training and learning tricks very fast. Every now and then she will do something and I will just think, "wow I cannot believe she just did that, she is so smart!" She absolutely loves the water already. 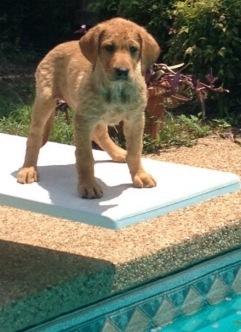 The first time she went swimming she ran and jumped into the water and swam. She is growing very fast, and loves to run around and play! I truly appreciate everything Bonni and Crumpler Kennels did. Honey is absolutely perfect, and I just love her to death! I would recommend Crumpler Kennels to anyone. Thank you for everything! Just wanted to tell you thanks for such a wonderful puppy. We named hercharley and she is such a wonderful young lady. 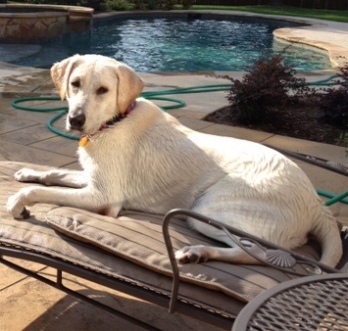 Loves our pool and madebest of friends with our other dog Rocko. We took her to the Vet today, 18 pounds and full of personality. Myfamily lovers her. I made it back to Afghanistan yesterday and I am ready to get back toTexas to raise my lab. A quick update on Jake. Loves to swim in our lake, loves to fetch, basically chew everything, and play with brother in laws 2 dogs (Catahoula mix pup and Australian Shepherd). We share a 137 acre property so he has lots of room to roam. He was 23 lbs+ at last vet visit. Our vet was very impressed with his book that you prepared. Have already recommended you all. May send you another update down the road a month or two. 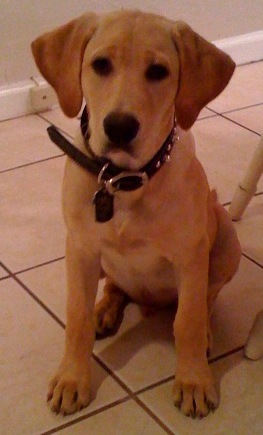 Bodie joined our family in June of 2011 as a tiny puppy that took a huge flight all the way to Syracuse, NY! Training Bodie has been an absolute joy- she has the most wonderful temperament and follows us around like a shadow. In January 2012 she helped us welcome our first child Tyler with love and understanding. She is very protective of him and can usually be found laying within a few feet of wherever he is, patiently letting him grab her ears! They are very close friends and Bodie seems to intuitively know that Tyler is going to grow up to be her pal. We enjoy taking her for hikes with us on the weekends and she will begin duck hunt training this fall-so far she is patient and not gun shy. Thank you Crumpler Kennels and especially Bonni-we could tell from the moment we decided to take Bodie into our family that she came into this world knowing what it is like to be loved. Ralph is AWESOME! He loves his kennel, knows how to "sit", loves to swim in the lake and brings us so much JOY! He and his sister "Miller" get together about once a week to wrestle and play. They are too darn cute together. Ralph's vet has been very impressed with his teeth, coat and bone structure. Ralph has been great on his leash and often accompanies me on my morning jogs. He is becoming quite the charmer too! Thanks for all your help! I will send you a pic soon! Ralph wants his face to be up on the web site too!!! Maggie just turned a year old this month. We love her and she has been a great addition to our family. This was taken after her favorite pastime- swimming with our boys. I just wanted to let you know how happy we are with our puppy. I am attaching a couple of pictures as well. She is very loving when tired and a complete go getter when she is awake. If you ever need a recommendation please let us know and we will gladly give you one. Thank you. We just wanted send you a quick note. As I'm sure you know tomorrow is Sirius' 1st Birthday! And while we are well stocked up on pup-a-roni and squeaky ducks we would be missing the much loved and honored guest if you weren't such a great puppy mommie. Thank You! Sirius is a beautiful dog- inside and out. He literally loves everyone. 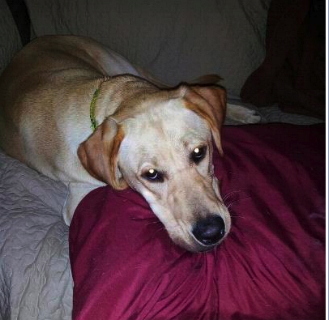 He has never met a stranger--person or dog, he loves to play chase, and hangs out like he always has at out feet. 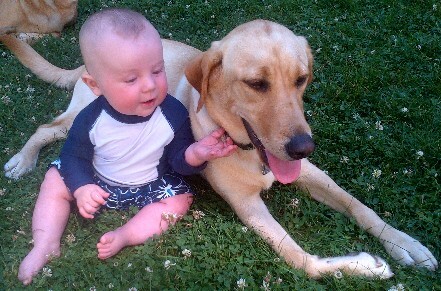 He spends most of his time with people or his friend Cassie (a yellow lab.) He is so sweet and laid back, until the squeaky comes out. Then he's a dog with a mission. 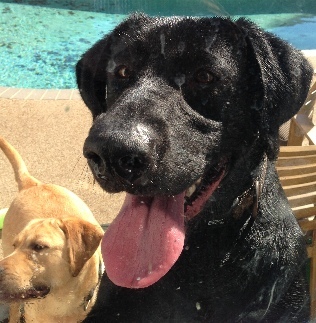 He loves water, and even in this weather we have a hard time keeping him out of the pool. He really is a wonderful doggie. Thunder arrived at his new home at about 10:40 last night. He slept most of the way. He checked out his new home and his new best friend Flynn ( Kayla's Coton). Flynn owns our house so there were a few anxious moments when his growl seemed vicious and we were afraid to put Thunder down on the floor. Thunder never flinched he stayed calm and just watched. Thunder slept well and we did not have to give him his litter blanket. This morning after a couple of tense moments we introduced the 2 again and they were chasing each other everywhere. Thunder has already adjusted to home, is very brave and confident and surprisingly already responding to his name. Can it really be this easy? I just took this picture for Valentine’s Day and started thinking of what a wonderful family dog we have. Our “Maddie”, (the daughter of Gordy –Oct 2007) was our very first baby and when we welcomed our own baby (years ago), the transition was nothing less than magical. Maddie is the most loving, patient and tolerant dog. She endures playing dress up, tea parties and loves swimming in the summer. Our only daughter continues to say that Maddie is her sister and best friend. We couldn’t be any happier with her personality and fit for our family. I can't say enough good things about Bonni, or my puppy, Miller. She is 11 months old now and we have been beyond pleased with her. 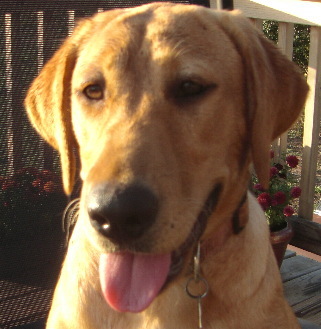 She went to 8 weeks of obedience/hunting training with Roger Conant at Landmark Retreivers this past fall. She is trained to hunt, but did not go out this hunting season (my husband is more of a recreational hunter), so all I can really tell you is how training has been. Roger continuously told us how impressed he was with her and how smart she is. He wanted to know where we got her, and was shocked at the reasonable amount she cost us. 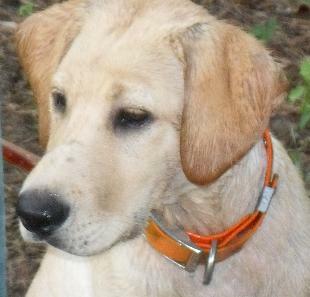 She was very "birdy" from day 1 and we have been told that she was not gun shy at all. During training she would sit by our side when the bird was thrown, go after it on command (her name) and bring back to a heel and hold until we tell her to drop in our hands. She follows here (come here or turn right), heel (come back to my left or turn left), sit, stay, etc. She picked things up extremely quickly and was really a week ahead of schedule the whole time. She was easy to house train, loves other dogs, people, small kids etc. I think the most impressive thing about her is that she doesn't chew. 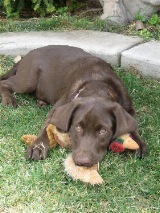 Being my first lab I had heard horror stories, but she has never once chewed on anything other than her toys. She has A LOT of personality and is truly a joy. She is of course playful, but when she's in "working" mode she gets to business. We do have a shock collar for her that we put on when she works, but we rarely even turn it on. We can also walk her with no leash and she'll stay in the heel position at our side. It's obvious that Bonni does this because she loves it, not for the money. wanted to send pics to u. 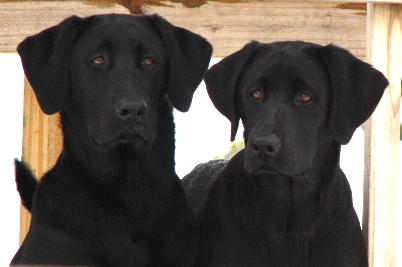 These are the 2 most wonderful dogs. They were housebroken quickly....Dog door in 2 days......Cried only 1 night in crate....just wonderful!! Play mostly with their toys...can't tell u how hood they are. 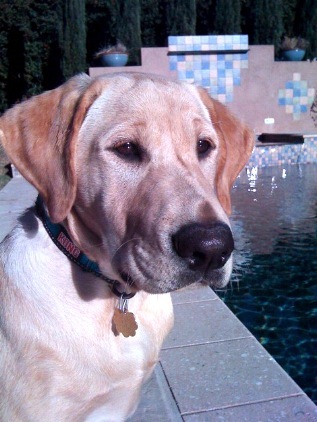 Gracie is the perfect dog...so lovable, first housebroken, & absolutely been a dream. Gabbie is great too, but very different temperament. She does not like to be held for long, took much longer to housebreak & is a barker. But we love them so much. This is Max, I bought this beautiful pup from you back in 2011. He is out of Luke and Lexi. He has been nothing but a joy to me and my family. He was very easy to train. As you can tell from the photos he has a personality of his own. He knows when it is time to hunt, play or just lay around the house. I believe he was born to hunt because it seems like its all he thinks about. I would like to thank you for the excellent job you do of breeding labs. I get compliments on what beautiful dog he is all the time. Thank you so much for producing such a high spirited, driven dog. Robby is now the biggest!! In order from back to front - Rookie. Then Robby and then we have Rowdy and yes u were right...he is living up to his name. Let Robby out and he stretches big and then flops over requesting a tummy rub. Rowdy fusses while we go thru the wake up Robby process. Rookie is more independent and rushes out the door, rethinks it and comes back for a little attention. They all sleep thru the night in their crates, 2 accidents - 1 my fault for not listening to Rookie tell me he needed a few more minutes. Very proud of these boys...nice job;). I was able to catch this rare sweet moment.